One of the single best quotes regarding the importance of Human Resources Analytics was first stated long before today’s vision of workforce intelligence was imagined. The statement refers to the use of human capital, not necessarily the human resources department. There is a large gap in information in both directions of the relationship between employee and employer and that often results in an imperfect labor market. By bringing together information from employees, employers and the external labor market organizations are able to create a more effective environment for themselves and their employees. This means higher productivity, and happier, more engaged employees. While many software packages provide HR analysts with countless tools for analyzing data on the fly, few are successfully driving strategic objectives and metrics beyond the highest levels of organizations. 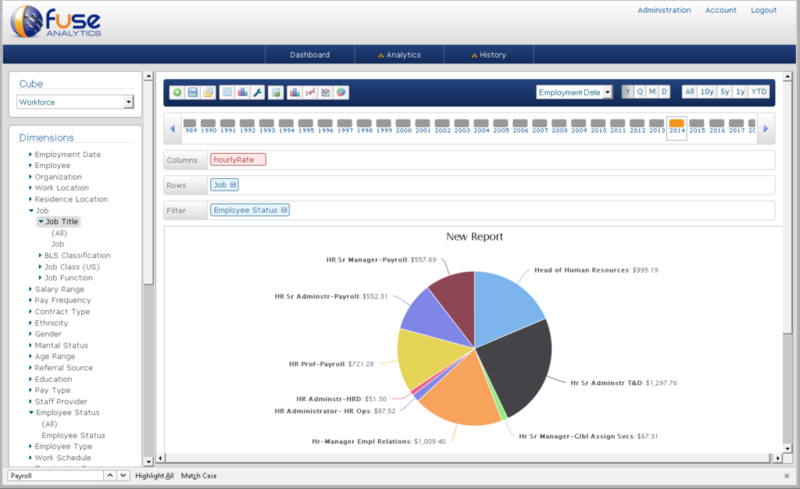 Fuse Analytics was designed for the functional HR user or Line Manager, Region Manager, Business Unit Manager and Executive stakeholder. Fuse provides a level of intuitive reporting required to engage all users in business intelligence from top-down to bottom-up. 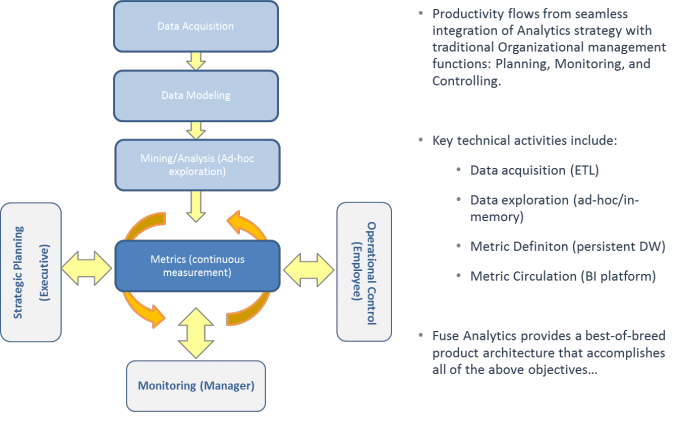 Fuse Analytics offers not only a multi-purpose data and document repository but also a full stack of BI tools made for the future of HR Data + Document Management serving HR’s stakeholder base directly rather than only HR itself. In turn, HR can focus on the strategic initiatives instead of struggling with on-demand reporting to Line Managers, Region Managers and Executive level users. 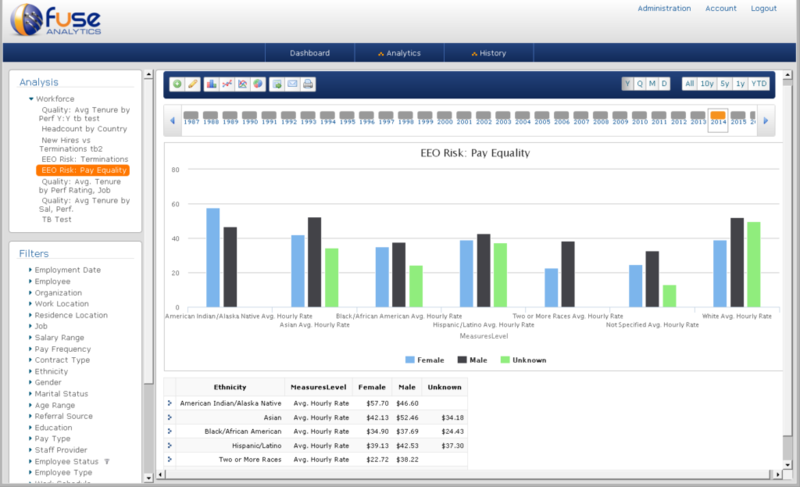 All metrics for HR can be categorized in terms of whether they contribute to Risk Management, Costs, and Quality. Some case study examples are outlined below. 1) Risk: EEO and Pay inequality. A diversity and employee relations group reports monthly off US ethnicity codes and gender for an overview of average compensation rates. (The same is done for hires, terminations and other key metrics to ensure no potential bias trends appear). In the United States an employer can be liable for up to $300,000 per employee affected by discrimination. Long term insurance premiums for this coverage compound the expense over many years and the goodwill damage to well-known brands and future recruiting is immeasurable. 2) Cost: Review total cost (or per capita cost) by population segments. In the example below managers can see how costs are distributed across roles or job categories (or any other filter). This can be applied to revenue per head, margin per head, or expenses per head in addition to direct or indirect labor costs. This can be integral in assessing reorganization efforts, software and services outsourcing business case development, and competitive strategy analysis. 3) Quality: Tenure vs Performance. As shown below (where ‘1’ is the highest performance rating) we can see tenure is highest among the lowest performers specifically in the salary range $82,400-100,000. The Fuse Analytics platform easily allows users to further drill into data to determine which business units, countries, job titles, and many other dimensions are most heavily represented so that actions can be targeted to specific groups throughout the organization. 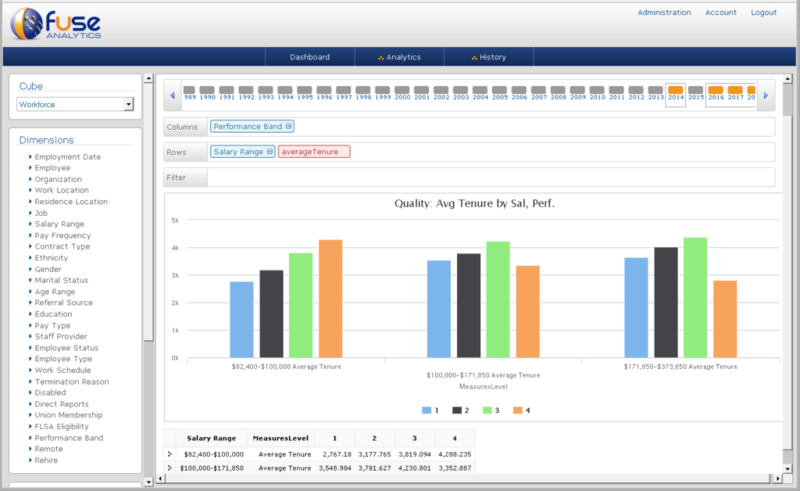 Even with increased demand on HR to provide more reporting, Fuse Analytics helps customers reduce the need for additional reporting analyst headcount and still excel at the Reporting and Analytics function.